Linear 40 - for aeration of small septic tanks and water tanks of 500 gallons or less. - $350 for complete system with 20' of 3/16" air line and diffuser. 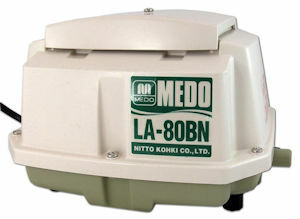 Linear 80 - for aeration of medium septic tanks and water tanks of 1000 gallons or less. - $450 for complete system with 20' of 3/16" air line and diffuser. Linear 120 - for aeration of large septic tanks and water tanks of 3000 gallons or less.- $650 for complete system with 20' of 3/16" air line and diffuser. 1 acre pond aerator - The economical, oil-less 905, 1/15 hp but fully capable to aerate a 1 acre pond completely - $350 w/ 100' of 3/8 air line and a lake bed diffuser. 3 acre pond aerator - large, heavy duty 1/4 hp oil-less air pump, 110AC, w/ 100 of 3/8" air line and lake bed diffuser. - $450 Note - the linear pumps are quieter than the oil-less piston pumps. A waterproof and sound dampening case is available for the above pumps @ $100 if needed. 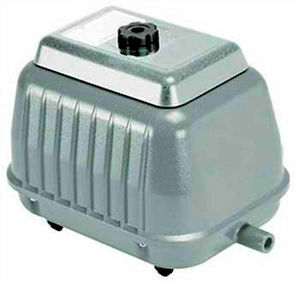 All repair parts are available for these pumps which all come with a one years manufactures warranty. There are no timers, fans, etc needed for these pumps. They are designed to run 24/7 for years. Koenders - 3 acre pond aerator w/ heavy duty water proof case - $650. This is a very heavy duty aerator made for farmers and ranchers. It weighs about 100 pounds. It is a bit noisy but a sound dampening case which can be buried is available @ $100 if needed. 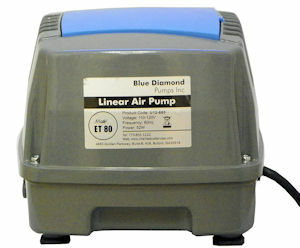 This pump will last for years, has a 1 year warranty, parts are available and we have sold thousands of them. Again, no timers, fans, etc. It is designed for running 24/7. It comes with 100' of air line and a lake bed diffuser.